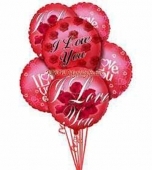 6 high quality Mylar balloons for your love ones. Your purchase includes free greetings card. Balloon is only possible to deliver Metro Manila in arrange. However, we can deliver also to province but deflate and it will be in a box. Recipient needs to inflate the balloons.